[Review] Dell Inspiron 17-5755 12GB of RAM and 2TB of storage for how much? 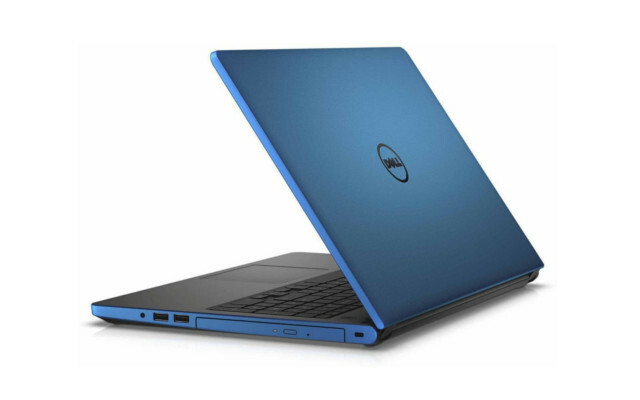 HomeDell laptop[Review] Dell Inspiron 17-5755 12GB of RAM and 2TB of storage for how much? It’s pretty easy to look at the most expensive laptops to try and identify the most important ones. But a more grounded reality is the fact that the majority of people won’t look for the premium line; they’ll go instead to the mid-range models, those who offer capable features for a lower price. Those are usually, in their own way, the most important of them all. This is the review of the Dell Inspiron 17-5755 (series 5000), a mid-range system that has a twist: a bigger than average size that's usually reserved for more robust machines. Just what is this laptop all about? Keep reading to find out the details. Pros: backlit keyboard, big 2TB hard drive, 12 GB of RAM, up to 7 hours of battery life, low price point. Cons: just one USB 3.0 port, not Full HD. The first thing you’ll probably notice about the Inspiron 17 is its size. That’s thanks to its 17 inch screen with 1600x900 resolution, which is a bit higher than regular HD. Laptops don’t get bigger than 17’, and as we mentioned above, this is not a regular feature on this price-range; so that’s definitely a welcomed addition. One of the best things Dell has achieved with its laptops is their design. They vary somewhat from each line, but they share the same basic principles and the results are pleasant. This one in particular sticks to a matte black plastic that gives it a simple yet elegant look. All of that is topped with the addition of a much-appreciated backlit keyboard, and we cannot stress enough about how useful this feature is and how rare it is to see it for such a low price. One of the best things you’ll find here, for sure. Instead of using a more conventional Intel processor, this particular Inspiron goes for an AMD Quad-Core A8-7410, a low voltage chip with a speed of 2.0 GHz that can go up to 2.5 GHz if necessary. For those who dwell better with Intel names, that roughly translates to a Core i3 chip (of the same low voltage line). Those numbers mean a couple of things. On the performance department, you can expect to do web browsing and run office-like software without problems. Media consumption isn’t a problem either, so have fun watching movies and the sort. You’ll want to keep out of very demanding applications and tasks like 4k video editing, though, since those will probably slow you down a bit. On the other hand, you get to have a better battery life because of the low consumption, so that’s not without gain. Besides, you’ll be able to multitask like a champ thanks to the 12GB of DDR3 RAM with a speed of 1600MHz. A extended work session with lots of apps and chrome tabs open won’t be a problem. As expected for an integrated GPU, games aren’t really this laptop’s thing. And they never were intended to. Only low demanding titles like indies and older classics are real options. If you go back enough, or simple enough, you’ll even run some of them flawlessly; but modern titles are not something you want to try. Still, this is not the laptop’s purpose. Dell says the Dell Inspiron 17-5755 will last up to 7 hours without the need to charge it thanks to its 4 cells smart Lithium-ion 40 WHr battery. Since it’s healthier to expect a bit less than that, we can safely go with 6 hours this time around, a bit less with more heavy use. This is the part of the review of the Dell Inspiron 17-5755 in which we can appreciate its processor: this long battery life is certainly a welcomed feature for such a big machine. The most surprising thing about this laptop is probably how much storage it has with its whooping 2 TB mechanical hard drive. The 5400 RPM speed isn’t the fastest out there, but you certainly can’t beat that size. 2 TB is basically unheard of in laptops, much less for this price. On the connectivity department we have our usual fare: one USB 3.0, two USB 2.0 for a total of three ports; HDMI for external displays, a microphone/audio jack, a welcomed Ethernet port for wired internet connection and the latest Bluetooth 4.0. DVDs and music CDs are also available to you thanks to the optical drive present. Once we took an in depth look with the review of the Dell Inspiron 17-5755, we can observe this is quite a rather unique machine. It’s kind of an affordable monster thanks to its big 17’ screen, 2 TB hard drive and accessible price. If you want to go big for less, Dell has the best possible answer here. You’ll be able to store countless data and enjoy immersive multimedia experiences. The machine is Certified Refurbished by Amazon, so you can expect to get a great quality product for what you’re paying as well as all the guarantees that Amazon has to offer. You can look up pricing and availability here.